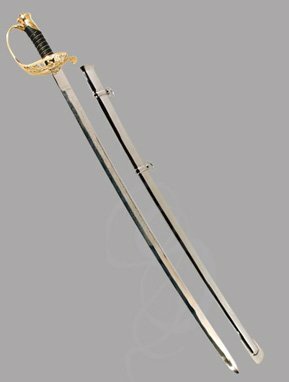 This sword is a beautiful reproduction of the 1850 Civil War era Foot Officer's sword. It features a high carbon steel blade that is acid etched with the letters "US" amidst an intricate and highly decorative floral pattern. The hand guard also features the decorative floral pattern and the letters "US". The attractive guard is made of solid brass. The handle is constructed of leather wrapped wood. 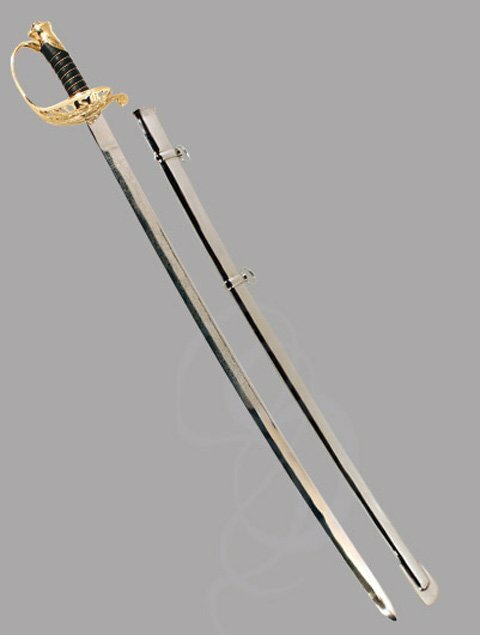 Because of a factory error, the price of this sword has been reduced drastically. During the blade forging process, the word "India" was scratched into the blade close to the hilt. It is not very noticeable but because of this imperfection the price of the sword has been drastically reduced. Includes steel scabbard. Blade is unsharpened.